Just a glance at your adorable toddler will make you feel the need to protect, care, and nourish the little one. When it comes to nourishment for your child, the best option is the mother’s milk. However, once it goes beyond the age to have the mother’s milk, the only option left is to provide the innocent child with the best possible food for proper nourishment. Most of you probably know the best possible food for your toddler. However, one area that is often overlooked is probiotics. Most of you may have heard about the term probiotics. But very few of you probably know about it properly. Probiotics are basically good bacteria that are naturally found inside your body. These were first discovered by Elie Metchnokoff, who was a Russian scientist and also happens to be the one who started the idea of including probiotics in regular diets. 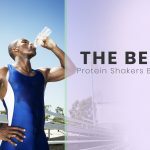 There have been several tests on probiotics and the results have proved that it can be one of the most essential ingredient that can help you lead a healthy lifestyle. The simple reason why a mother’s milk is concerned the best for babies is simply because it contains probiotics. However, there are several mothers who are unable to breastfeed their children due to several health issues. The best solution in such a case is to use a product that contains a formula, which includes probiotics. There are several types of probiotics that provide different health benefits. However, there are also some formula that contain probiotics, which are aimed at providing some specific health benefits. According to several researches done by scientists, probiotics have been proved to be rather necessary for infants. There was a time when people used to believe that amniotic fluid found in probiotics are sterile. However, this theory has been proved absolutely false by scientists. The type of bacteria found in the amniotic fluid is shaped almost similar to the gut flora found in a mother. There is a specific amount of gut flora necessary in a child to lead a healthy life. If you give antibiotics to your infant along with pasta or bread, this necessary amount does below the required level. Thus, the need for having infant probiotics arises. Probiotics can provide your toddler with several health benefits. These include digestive problems, mood, immune system problems, skin problems, and weight issues. There are both good and bad bacteria in your body. If there is a misbalance between the two types of bacteria, you will invariable feel several types of health issues. For example, if you often find your child suffering from digestive issues, it may be due to a misbalance between good and bad bacteria. Digestive problems may include acid reflux, colic, diarrhea, and constipation. If the situation gets serious then Crohn’s Disease and IBS or Irritable Bowel Syndrome may also happen in your child. The immune system of your child’s health may also be affected if there is a shortage of good bacteria inside the body of the toddler. Weak immune system will harm the overall development of the child’s body. 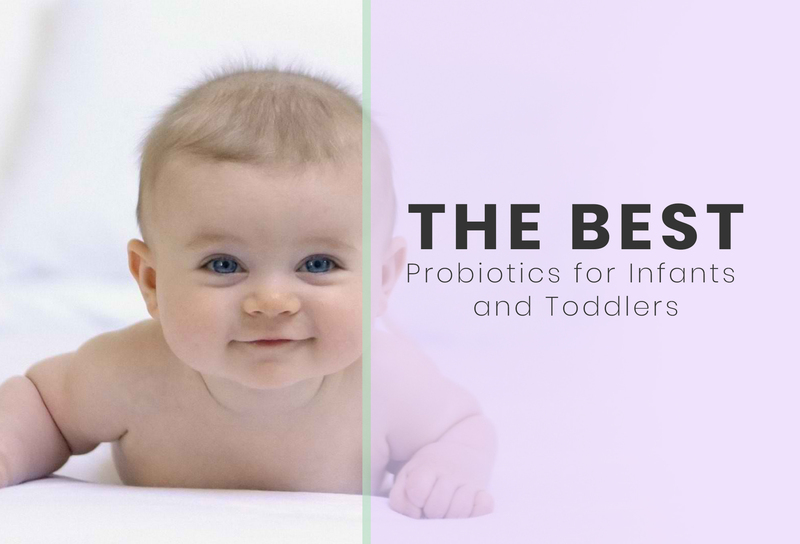 Even before you decide to give your child probiotics for infants and toddlers, there are some crucial things that you should know. Here are some of these important things discussed for your advantage. Without proper gut flora, it is very easy for your toddler to be prone to various unpleasant digestive problems such as constipation, acid reflux, colic, and diarrhea. Toddlers and infants without adequate amount of gut bacteria are easily at risk of developing several serious digestive problems such as Crohn’s Disease and IBS or Irritable Bowel Syndrome. It is essential that you provide the best probiotics for infants and toddlers to your little one. Make sure to do proper research work on such products before feeding your child. Also, look for those products that offer probiotics for infants and toddlers and vitamin C, along with other essential nutrients. It is essential for you to note that gut bacteria can do more than simply give rise to digestive problems. The best probiotics for infants can also prove effective in boosting the natural immune system of your child, as well as, their mood. The clinically-researched kids-friendly strains help to boost the overall digestive system of an infant and also improve their immune system. Along with physical benefits, Kids Probiotics also helps in healthy brain development for your child. For a toddler, the Children’s Grape Probonix will taste like a treat with its candy flavor. This product can easily take care of the digestive problems of your infant while giving the taste buds something to enjoy. The best part about the Culturelle Kids Probiotic is that you can easily mix it with hot or not too warm food or even beverages. This means that you can mix it in any food item that your child enjoys. It will give the baby all the essential health benefits without stressing him out. The ingredients used in the making of Baby Grow + Thrive Probiotics + Vitamin D Drops are extremely safe and gentle for toddlers. This helps to boost the immune system of the child, as well as, the entire digestive system. The Mommy’s Bliss Baby Probiotic Drops is absolutely vegan and is made with sustainable ingredients that help your infant have a bright future in terms of health. The best part about this probiotic supplement is that it is flavorless and comes in a pediatrician recommended formula in a liquid form. Protectis Baby happens to be one of the best probiotics for toddlers mainly due to the ingredients used in the making of the product. These ingredients are trusted by pediatricians and have also been tested in several clinics and found to be effective for infants. The formula used in the making of this probiotic product for infants is very gentle and is completely vegetarian. It does not contain any binders or fillers and is packed with 23 organic and RAW vegetables and fruits. These ingredients are carefully chosen in order to boost the healthy gut bacteria and enhance their ability to protect your child from other possible diseases. The product is available in the form of drops and can help prevent excessive crying and fussiness in your toddler, which can be a happy situation to all of you. It is available in a 0.34-ounce bottle that provides 5 drops. Kidophilus helps to support digestion in your little one and also boost the overall immune system. The formula used in this probiotic can effectively stop the growth of disease-causing bacteria in your toddler. It is designed to ease and soothe colic aches and provides potent boost of both prebiotics and probiotics to your little one’s diet. It contains more CFUs when compared to any other gripe water, probiotic supplement or probiotic drops. It is essential to provide probiotics to toddlers to boost the natural immune system of their body. This gets even more important if they have recently been on antibiotics due to some reason. 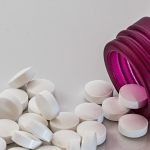 Probiotics will prove to be efficient when it comes to replenishing the overall health of the child and the healthy bacteria inside the gut that antibiotics easily destroy. Kids Probiotics contains a formula that makes it extremely beneficial to be given to toddlers after a course of antibiotics is over. The clinically-researched kids-friendly strains help to boost the overall digestive system of an infant and also improve their immune system. Along with physical benefits, Kids Probiotics also helps in healthy brain development for your child. Some of the probiotic strains found in the Kids Probiotics are lactobacillus plantarum, Bifidobacterium lactis, Bifidobacterium infantis, lactobacillus acidophilus, and lactobacillus reuteri. These have separate functions inside the body that includes boosting immunity, reducing acute diarrhea and IBS symptoms, controlling inflammation and regulating immunity, as well as, maintain a balance between the good and bad bacteria. The Kids Probiotics is ideally suited to be given to your child during and after giving antibiotics. The product has been clinically researched and it is also kid-friendly strains. The Kids Probiotics does contain minor traces of milk protein. It may sometimes be tough for smaller kids to swallow it. When it comes to probiotics for infants, a liquid product can prove to be far more natural than in any other form. Grape flavored liquid probiotics for infants can be even more interesting for little ones. For a toddler, the Children’s Grape Probonix will taste like a treat with its candy flavor. This product can easily take care of the digestive problems of your infant while giving the taste buds something to enjoy. Try giving a bad flavored probiotic to a healthy child. Chances are that he will simply refuse to have it. However, if you deal with a child who has digestive problems, he will naturally be cranky most of the time. Thus, feeding a tasty probiotic to the infant will be a better option. 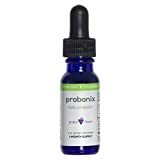 Just like the name, the Children’s Grape Probonix comes in a grape flavor. It can easily be mixed with cold liquids. There are many parents who say that their children dislike the flavor. There are also some who have reported problems with the applicator. When you notice your toddler suffering from digestive problems, it will break your heart to see the infant crying all the time. 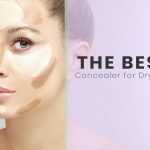 You will naturally feel like doing something to give some relief to the little one without risking dehydration due to bowel issues or vomiting. This is where Culturelle Kids Probiotic steps in the picture. The product naturally and easily treats several symptoms that can encourage you to try probiotics for infants’ constipation, digestive problems, and diarrhea. When it comes to toddlers, you will always want to give something to the child that is easy for the little one to take. This is especially true during those days when the infant feels unwell. Imagine giving your child something to eat or drink that tastes or smells bad, on days when the toddler is not feeling well and is cranky. The best part about the Culturelle Kids Probiotic is that you can easily mix it with hot or not too warm food or even beverages. This means that you can mix it in any food item that your child enjoys. It will give the baby all the essential health benefits without stressing him out. The Culturelle Kids Probiotic is absolutely free from dairy fillers. The best part about this product is that it can easily be taken with or without food. It basically has no taste. 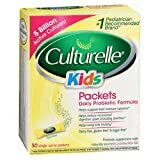 The price of the Culturelle Kids Probiotic is slightly on the higher side. The ingredients used in the making of Baby Grow + Thrive Probiotics + Vitamin D Drops are extremely safe and gentle for toddlers. This helps to boost the immune system of the child, as well as, the entire digestive system. It also provides good bacteria to your child and is rather helpful in building a rather strong foundation for your child’s overall healthy development. The probiotic combines Lactobacillus Rhamnosus GG, which happens to be one of the most clinically studied probiotic in toddlers. The product also contains 10gm vitamin D that is helpful in building strong bones for your child. The Baby Grow + Thrive Probiotics + Vitamin D Drops is from one of the most pediatricians recommended the brand, so you can easily feel confident about your choice of probiotic supplement for your child. It is needless to say that a healthy gut will help boost the immune system for your infant. This probiotic supplement is free from sugar and gluten, as well as dairy binders. This makes it safer for your little one. There are no hidden ingredients in Baby Grow + Thrive Probiotics + Vitamin D Drops. It contains one of the most clinically tested probiotic. The product is especially designed for small babies. The formula used in the Baby Grow + Thrive Probiotics + Vitamin D Drops is a bit sticky and may prove to be difficult to measure sometimes. The Mommy’s Bliss Baby Probiotic Drops is absolutely vegan and is made with sustainable ingredients that help your infant have a bright future in terms of health. The best part about this probiotic supplement is that it is flavorless and comes in a pediatrician recommended formula in a liquid form. 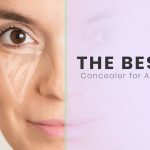 This helps your child have the product without making any fuss and also helps you administer it without much of a problem. It contains the probiotic strain that is also the most clinically studied in babies. There are approximately 1 billion lactobacillus Rhamnosus GG cells in each serving. The packaging contains about 30 servings for your child. The product is extremely useful in dealing with gas, diarrhea, colic, and constipation problems in your toddler. There are no harsh chemicals, parabens, and additives in this supplement. It is also free from any artificial colors and flavors, as well as, gluten, soy, and dairy. The Mommy’s Bliss Baby Probiotic Drops is one of the most recommended products by pediatricians. The probiotic supplement does not contain any additives. There are some packages that may have issues with the dropper. It needs to be kept away from light and humidity. It is needless to say that originals are always better than the copied versions. This is also true when it comes to any baby products. Protectis Baby happens to be one of the best probiotics for toddlers mainly due to the ingredients used in the making of the product. These ingredients are trusted by pediatricians and have also been tested in several clinics and found to be effective for infants. Is your child suffering from colic or diarrhea or constipation or any other stomach problems? Feeding him with Protectis Baby can be a good idea as it can effectively help your toddler feel better and strong once again. Providing organic probiotics for infants to your toddler will help the child feel healthy and happy and it will also let you get proper sleep at night. The formula used in the making of this probiotic has been clinically tested to reduce crying in toddlers due to colic. The Protectis Baby happens to be the original probiotics drop for infants. It contains vitamins D3 which is good for the bones. The plastic container of the product is absolutely BPA free. The price of the Protectis Baby is slightly on the higher side. When it comes to feeding infants, no parent will event want to give the little one something that contains harsh and unhealthy ingredients or is impure. This is why the Garden of Life – Raw Probiotics Kids has gained immense popularity. The formula used in the making of this probiotic product for infants is very gentle and is completely vegetarian. It does not contain any binders or fillers and is packed with 23 organic and RAW vegetables and fruits. These ingredients are carefully chosen in order to boost the healthy gut bacteria and enhance their ability to protect your child from other possible diseases. Apart from the super ingredients, Garden of Life – Raw Probiotics Kids is 100% free from gluten and sugar. It is also certified as being completely organic and does not contain any soy allergens. You can be rest assured about the safety of the product for your toddler and the little one will surely feel good and happy after consuming the product. 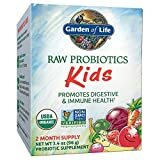 The Garden of Life – Raw Probiotics Kids does not contain any fillers or binders. 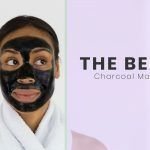 The ingredients used in the product are completely organic. There are no negative factors of this product. Trying to calm down an infant suffering from colic problems can be a stressful task for any parent. However, with the help of the Soothe Probiotic Colic Drops such issues can easily be solved. It is made by one of the most trusted brands by pediatricians, Gerber, and is especially designed to give your child relief from colic pains. The product is available in the form of drops and can help prevent excessive crying and fussiness in your toddler, which can be a happy situation to all of you. It is available in a 0.34-ounce bottle that provides 5 drops. You are to administer 1 drop a day. The probiotic supplement is not made with any genetically engineered ingredients and also happens to be a non-GMO product. There have been several clinical studies on Soothe Probiotic Colic Drops and it has been proved that it is can effectively reduce the crying time in a breastfed and colicky baby by almost 50%. This means that you can sleep peacefully at night once again. The formula used in the Soothe Probiotic Colic Drops helps to ease colic. It is a non-GMO product.-It is the number 1 pediatrician recommended brand for colic problems in infants. It is a comforting probiotics supplement. It is a bit on the costlier side. Does your toddler dislike the taste or even the smell of medicines? Well, that is a very common thing amongst infants. However, with Kidophilus there is no possibility of your child not liking the product. It tastes good and is available in the form of drops. Just a few drops of the probiotic and your child will be healthy and happy once again. Kidophilus helps to support digestion in your little one and also boost the overall immune system. The formula used in this probiotic can effectively stop the growth of disease-causing bacteria in your toddler. It can reduce flatulence and bad breath, clears up any yeast infections, reduces constipation, and also helps in the process of digestion for the child. 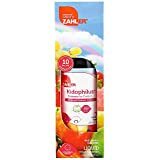 The Kidophilus happens to be a fruit-pinched flavored liquid. The product itself is manufactured in a GMP-certified facility. The price of the product is quite affordable. This probiotic does contain certain preservatives. Are you always worried about administering the right amount of dosage to your infant? This is a common thing for all parents. Thankfully, Nexabiotic Probiotic Powder for Infants and Toddlers has made this task for parents very simple. It comes with pre-dosed power in the form of capsules. These capsules are flavorless, which means that you can also mix it in your kid’s drinks and food without letting them know of its presence. 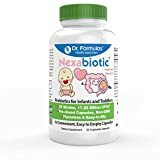 Nexabiotic Probiotic Powder for Infants and Toddlers contains several probiotics and prebiotics such as Saccharomyces boulardii, Bifidobacterium animalis lastis, and Lactobacillus acidophilus. There are also 20 other probiotic strains along with these contents. This probiotic supplement easily supports the overall immune system in babies and also the regular stools and bowel movements. This product is especially designed for babies, infants, toddlers, as well as, little kids. It is designed to ease and soothe colic aches and provides potent boost of both prebiotics and probiotics to your little one’s diet. It contains more CFUs when compared to any other gripe water, probiotic supplement or probiotic drops. First of all, the Nexabiotic Probiotic Powder for Infants and Toddlers is entirely made in the United States of America. It has pre-dosed power in the form of capsules. This product may prove to be dangerous for immunocompromised toddlers. As a parent, the first and most important thing that comes to your mind is your infant’s health. No parent will like to see their child suffer from indigestion and colic pains every now and then. According to several pediatricians, one of the best ways to give them relief from such digestion problems and colic pains is to feed them probiotics. It helps in improving the overall digestive system in little ones and also boost the natural immune system of their body. The probiotics supplements discussed above are the best possible supplements for your little one available at stores. If you have never added any probiotic to your infant’s regular diet, then it is always a good idea to add it from today itself. You will invariably notice the improvement in your child’s health with regular administration of the supplement to your toddler.